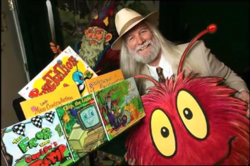 Award-winning children’s book author, Tim ‘Dr. Hope’ Anders with Alpine Publishing is proud to offer this new special on his children’s books, with part of the proceeds going to help Hurricane Sandy victims. Now, through the end of November, when Alpine Publishing sells 3 books or CD’s from Tim ‘Dr Hope’ Anders collection, they will give away the 4th book or CD free AND donate 10% of the sale proceeds to help Hurricane Sandy victims. Children’s book author, Tim ‘Dr. Hope’ Anders of Alpine Publishing, has unveiled its new November sale special to help victims who have been affected by Hurricane Sandy. Tim ‘Dr. Hope’ Anders, Alpine Publishing’s award-winning author, is proud to be offering this month long special in support of Sandy victims. For the month of November, when readers buy 3 books or CD's from Dr Hope’s Laughing Day Library website, Alpine Publishing will give a 4th book or CD of the reader's choice for free as well as donate 10% of the proceeds to help Hurricane Sandy victims affected in the northeast. “We wanted to do our part and give what we could of our proceeds from book and CD sales to help those who have been devastated by the hurricane,” said Dr Hope. There is currently a wide selection of Tim ‘Dr Hope’ Anders’ books up for grabs on the website here: http://laughingday.com/buyabook.htm, including ‘Chip the Little Computer’, ‘The Frog Who Couldn’t Jump’, ‘Everybody Calls My Father, Father’ and many more. Anders has also published several bilingual (English/Spanish) books that are available online for ordering as well. Tim ‘Dr. Hope’ Anders is not only the author of several award-winning children’s books, but has also authored several health and lifestyle books with Alpine Publishing. He is also an avid musician and professional poker player. For more information about Tim Anders, please visit http://drhope.com/. Alpine Publishing is a publisher of children’s books, as well as health and lifestyle books, the true love story of Tim ‘Dr Hope’ Anders parent’s life, ‘Everybody Calls My Father, Father,” (his mother was a Broadway actress and his father was a Catholic priest) and children’s CD's full of music and adventure. Located in Fallbrook, CA and Las Vegas, NV, their goal is to provide quality books that promote a healthy and happy body, mind and spirit.